After waiting for 15 minutes to have our order taken we expected the coffees would be served quite quickly to make up for this. On the contrary, we waited another 15 minutes for the food to arrive with the coffees nowhere to be seen. When they did arrive, the large flat white ordered was a regular, the smoothie was MIA and we asked for table water for the second time. The coffee drinkers of the table were divided although the majority found it to be weak and bitter. Skim cappuccinos and other coffees of regular size are $3.50 while large mugs are $4.50. 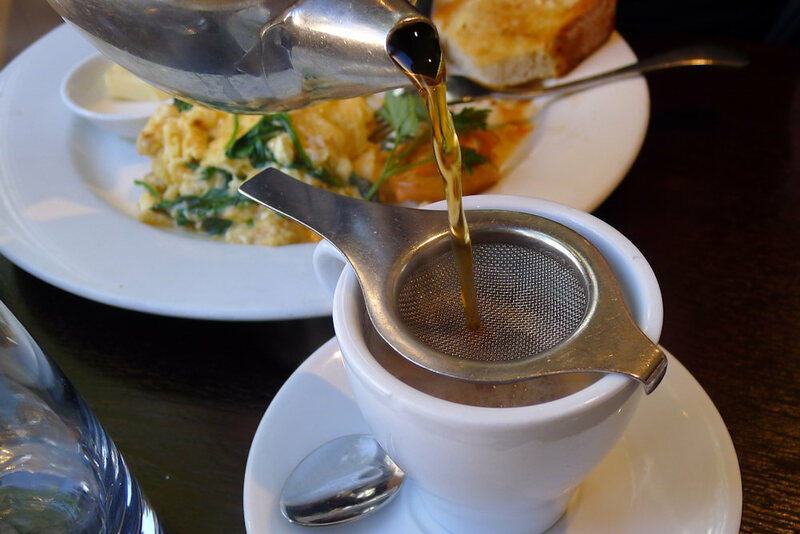 Our guest enjoyed her English breakfast tea ($3.80) however due to a large number of tea leaves in the pot it quickly became bitter. A second waitress served the food. She said that some of the items had been mixed up due to the fact they were so busy. We looked around at the empty tables and queried the excuse amongst ourselves. 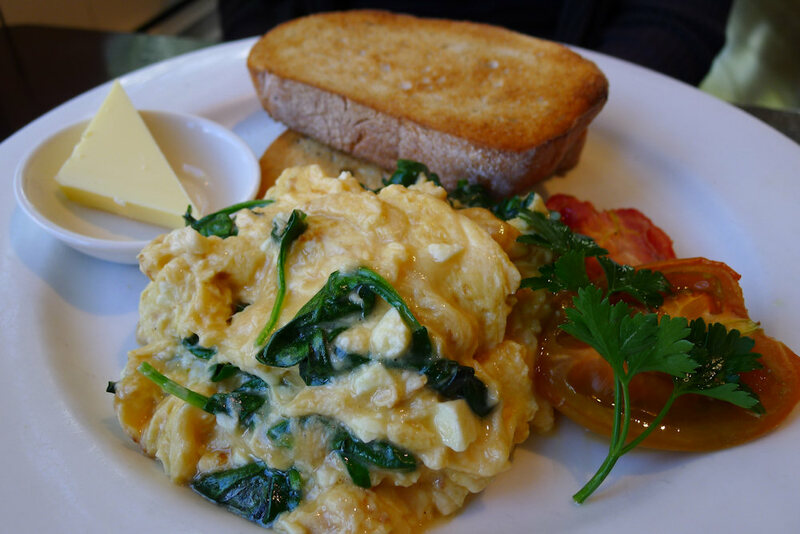 The spinach fetta ($13) eggs was served with roast tomatoes and thick sourdough bread on the side. It was one of the more reasonably priced dishes and our guest was happy with the flavour. So far so good. The next dish was not as good, as our guest found the eggs Benedict ($16) quite disappointing. The toast was thin and dry and barely enough to mop up the two eggs and hollandaise sauce. He asked for extra toast and was charged $4.50 for two thin slices of Turkish bread. The total cost of the dish sky-rocketed to $20.50 and he was not impressed. On the other hand we were quite happy with the vegetarian ($16) breakfast. 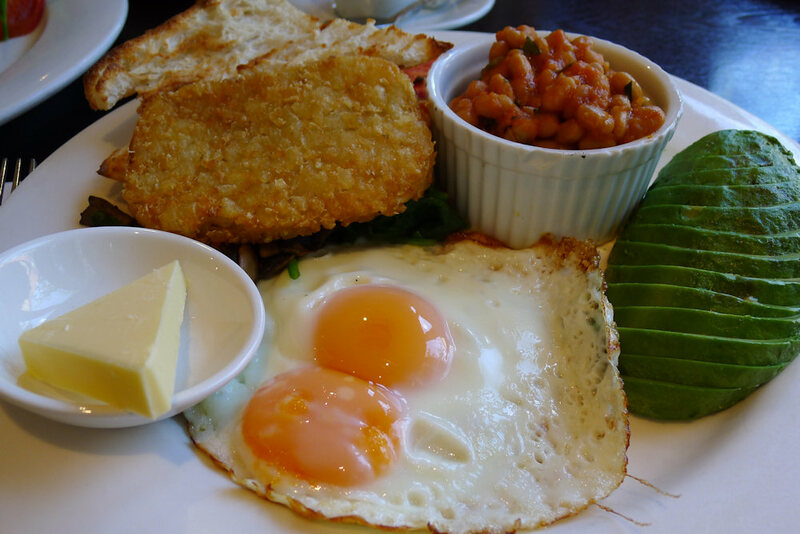 For the same price as the eggs benedict we got: a delicious hash brown, two eggs, sautéed mushrooms and spinach, baked beans, half an avocado and toast. The toast again was thin and dry and we could’ve done with more to spread the avocado on. 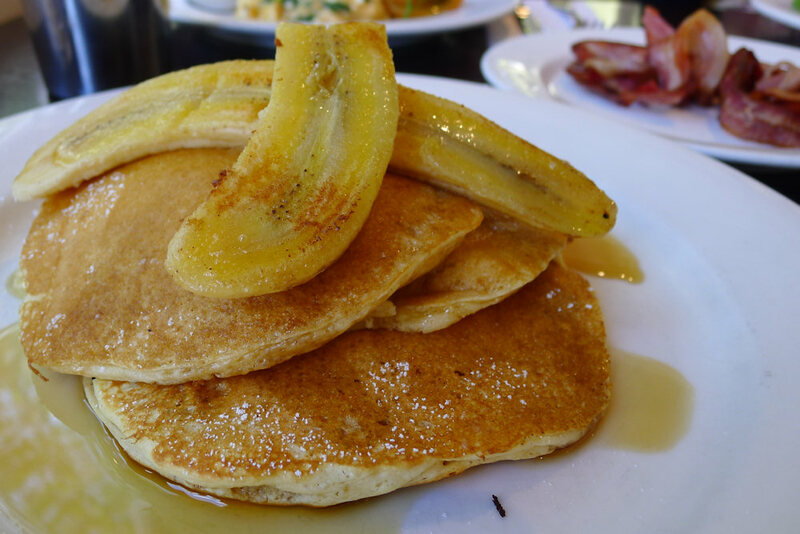 The pancakes are available in four varieties: maple syrup ($10), grilled bacon ($12), berry compote ($12) or caramelized [sic] banana ($12). Dane requested a combination of the banana and bacon (the sizeable amount of bacon being served on the side ($3.50)). The pancakes themselves were quite dry and really had no standout qualities. The banana was lightly fried and nowehere as interesting as the caramelisation sounded. Another order mixup was the Atlantic poached eggs ($15) which consists of poached eggs on Turkish with smoked salmon and Hollandaise sauce. Again, two very small eggs arrived on this plate. They had Turkish bread on the side and that was all. We spoke up and waited five minutes. 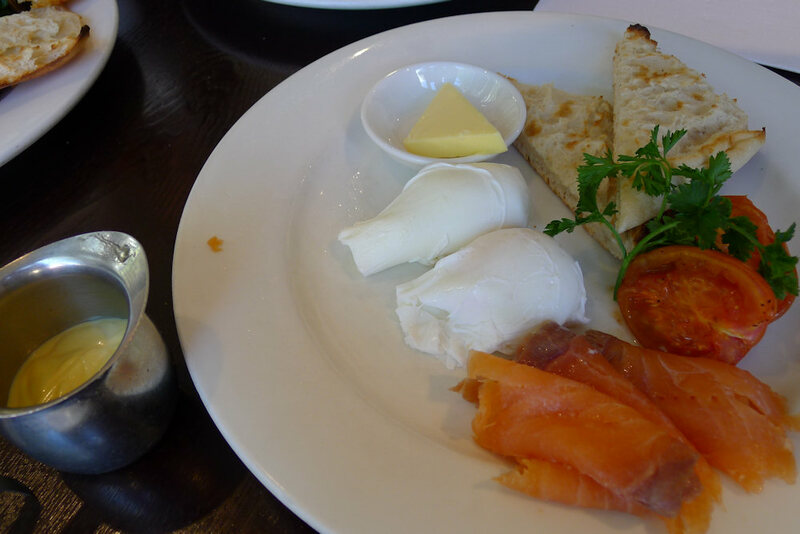 Eventually we took the plate to the counter so that it could at least be kept warm but the waitress brought over smoked salmon and Hollandaise which we combined on the plate above. The salmon was salmon, the eggs were eggs. 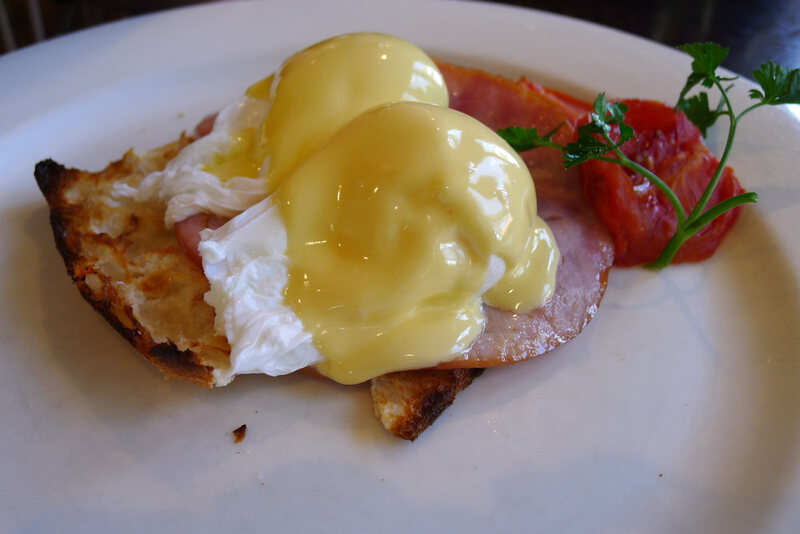 We found the Hollandaise too thick and simply had very little flavour to it. At this stage we’re not sure how differently the Atlantic poached eggs would have been served compared to our DIY breakfast. We have to be brutally honest and say that we hope no-one else receives the below average service we did. We were told it was because the restaurant was busy however we have been to over a hundred that suffered no negative effects with even more people to serve with fewer waitstaff. Perhaps it was just an off day for them and we hope it’s not a regular part of their dining experience. On a positive note, if you walk or drive to the end of Blues Point Road you can experience one of the best views in Sydney. The Harbour Bridge sits in the middle of the bright blue water and you can watch the ferries come and go. There’s a park with play equipment for children and a walking track around the headland. This entry was posted in Sydney - North Shore and tagged Free range eggs, Water glimpses. Bookmark the permalink. I’m sorry I have been going there for years and my husband and teenage children so disagree. It has such lovely staff and food is always great. You must have had a rare bad experience as I usually find your reviews exceptional. My husband and I live locally and this is our regular breakfast cafe (we have been known to frequent it twice in the one weekend!). 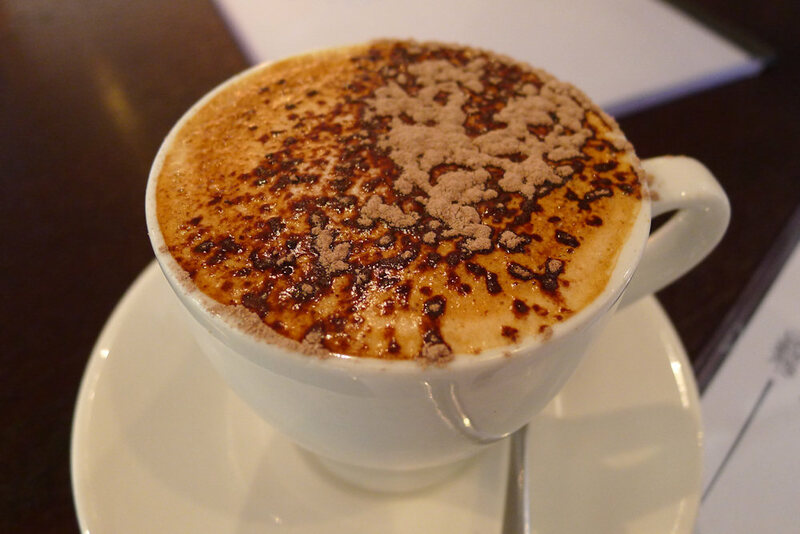 We find the food and coffee to be excellent and enjoy the friendly service. 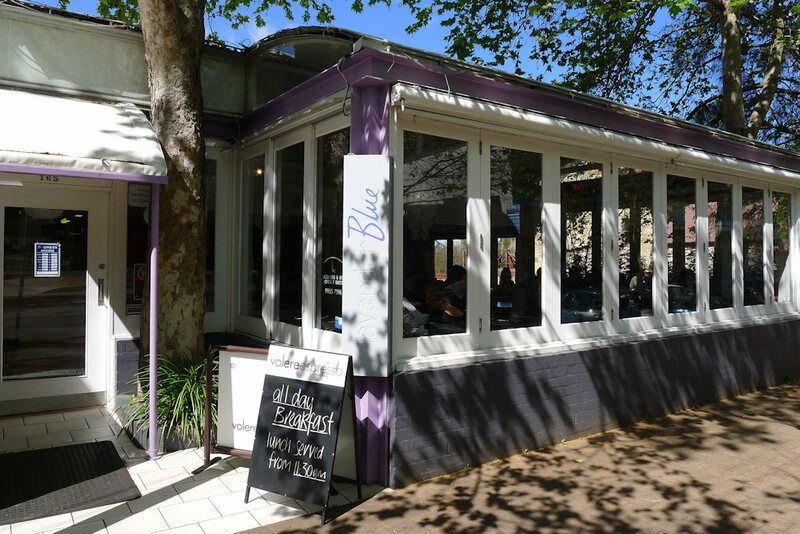 The prices are very reasonable and the atmosphere is delightful, particularly once the warmer weather permits the window-front to be completely opened up. I agree with Sharmika above. I have read your review and was very surprised. My husband and I worked for 3 years across the road and we ate regularly there. Breakfast and lunch and the staff were always extremely helpful and happy to help with any request. I used the restaurant for Pink Ribbon Cancer breakfast and they were fabulous. 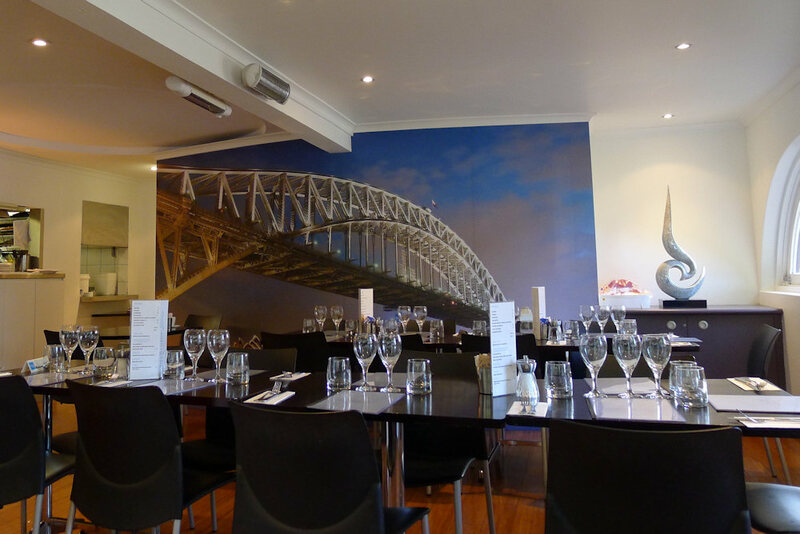 The coffees are always excellent and the cafe we feel gives great value for money. I am very concerned that you gave such a poor review and would only ask others to ignore it and go and see for themselves. April and I are glad that Lavender Blue has provided you with many good experiences. We go to each café with open minds and looking forward to a great breakfast. On this occasion there were many things that brought the experience down but the reason we re-review is because we may have visited on a particularly good or bad day. By the sounds of it, we will be returning!